Yesterday’s signals were not triggered as there was no bearish price action at 1.1315, although the low of the day was only 1 pip above the support level at 1.1257. Go short following a bearish price action reversal on the H1 time frame immediately upon the next touch of 1.1357, 1.1381 or 1.1397. 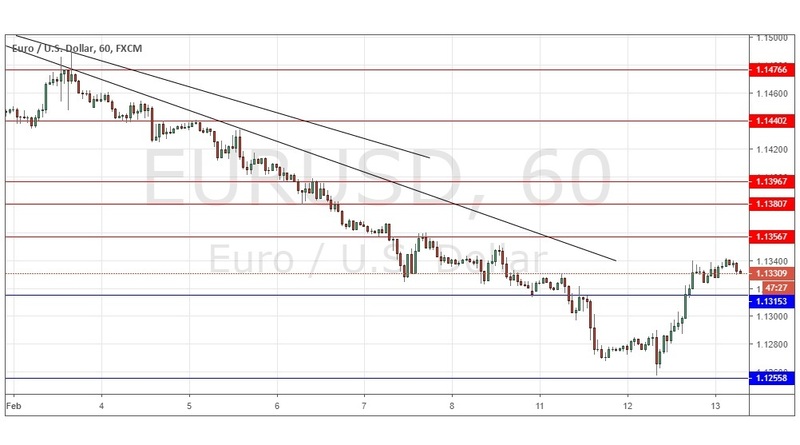 Go long following a bullish price action reversal on the H1 time frame immediately upon the next touch of 1.1315 or 1.1257. I wrote yesterday that I had no confidence that the bearish move would carry through despite the clear medium-term bearish trend, partly because we were in an area of long-term support and a very pivotal level at 1.1257, even though we just had a 50-day low close. For these reasons, I was prepared to get bearish at a rejection of 1.1315 or bullish at a strong rejection of 1.1257. This was a good call as the level at 1.1257 was missed by only half a pip or so and it gave a very strong bullish bounce. The picture now is mixed: medium-term bearish trend, but a strong rejection of the bottom of a multi-week range. This suggests the price is quite likely to rise further, but it will be slow and will be a struggle, so trading this pair is likely to be difficult over the short-term. There is nothing of high importance due today regarding the EUR. Concerning the USD, there will be a release of CPI data at 1:30pm London time.